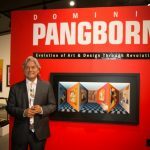 Park West Gallery’s founder and CEO Albert Scaglione shares his thoughts on Dominic Pangborn’s exhibit and opening night event at albertscaglione.com. “There was a lot of laughter and a lot of awe. His story is inspiring and hard to imagine in our culture,” says Park West Gallery Founder and CEO Albert Scaglione of Dominic Pangborn’s life.